Rain likely. Thunder possible. Low 38F. Winds W at 5 to 10 mph. Chance of rain 80%.. Rain likely. Thunder possible. Low 38F. Winds W at 5 to 10 mph. Chance of rain 80%. Lillian Marnhout filled 58 trashbags with roadside litter .#B#3BagChallenge. Pine Knot Elementary School fifth-grade teacher Tara Tucker (front) joined other teachers and administrators from the school to pick up litter for the #3BagChallenge. Tucker launched the challenge for her students, but she has been pleased with the overwhelming response in McCreary County and hopes other communities will follow suit. PRIDE always does its due diligence in seeking volunteers to help with Spring Cleanup every April. But with February's flooding having left more than Lake Cumberland's normal share of trash and debris in its wake, the nonprofit environmental awareness organization is upping its game this year with a social media call to arms. "To go along with our theme [Together We Can], we are encouraging volunteers to share photos of volunteering together," Tammie Nazario, President and CEO of PRIDE (Personal Responsibility In a Desirable Environment), stated. "On social media, tag your photos #PRIDESpringCleanup, #Volunteer and #TrashtagChallengePRIDE." The "trashtag challenge" dates back to 2015 but just last month went viral worldwide. A version in this region first launched March 18 in McCreary County. Pine Knot Elementary Social Studies teacher Tara Tucker issued a "#3bag challenge" to teach her fifth-graders civic responsibility. The students were asked to go out with an adult into their communities and pick up at least three bags of garbage -- collecting 220 bags in just the first week of the challenge that ended on March 29 with a celebratory pizza party. 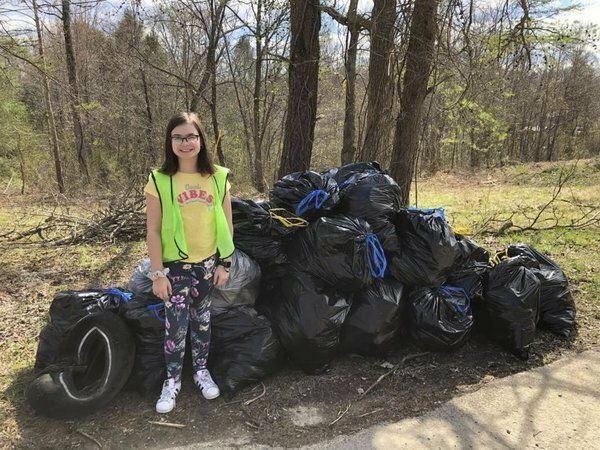 One of the students, Lillian Marnhout, was joined by her mother and a friend to pick up a whopping 58 bags' worth of roadside litter over two days. Tucker hopes the children carry this lesson for the rest of their lives. "These students are more than a test score to me," she stated, adding some have already told her about getting on to someone they were riding with who threw trash out the window of a car. "They're my future, and they're your future. Why not instill in them these ideas that will stay with forever?" Nazario praised Tucker's "exemplary leadership" in embracing the use of social media to do something positive as well as expressed pride in the students -- challenging citizens of all ages to follow their example.The initiative does seem to be spreading beyond McCreary's borders. Pulaski County Judge-Executive Steve Kelley gave the initiative his seal of approval during a fiscal court meeting earlier this week. "I think it's a neat idea," Kelley said. "I see students from all around the county accepting the #3bag challenge, basically going out and collecting three bags of trash and posting their picture with it.…It's a good program for getting our kids involved." "So many students need community service hours now," Nazario added, "and volunteering with PRIDE can be a fun way to earn those. "This challenge is easy and fun, but it makes a huge difference," she continued. "Just pick a spot this is ugly with litter, clean it up, and then post before and after photos with #TrashtagChallengePRIDE. You can also use #3BagChallenge so a great group of kids in McCreary County will know that you are following their lead." By joining the month-long PRIDE Spring Cleanup campaign, volunteers have the chance to prove they are proud to call this region home and make their communities look their best by picking up litter along roadsides and at local tourist attractions. The effort brings friends and family together while working in the great outdoors and inspires others to dispose of trash properly. "PRIDE is all about appreciating the beauty of our region and taking personal responsibility for your corner of it," Nazario stated. "When you look at it that way, you realize that spring cleaning outside your house or business or church is just as important as spring cleaning inside. "The flood waters have carried trash with them," she added of the situation this year, "but the silver lining is that cleanup will be easier now that trash is in central locations. When we get rid of that debris, then we can enjoy our beautiful scenery and a safer environment." Nazario said PRIDE's track record proves this year's Spring Cleanup theme of togetherness true. Since the first Spring Cleanup in 1998; 440,408 volunteers have donated nearly 1.5 million hours to PRIDE cleanups -- collecting 183,531 tons of trash plus 869,251 bags and 971,926 tires. "Clearly, together we can make a difference," she said. The 2019 PRIDE Spring Cleanup is sponsored by Walmart and Outdoor Venture Corporation. 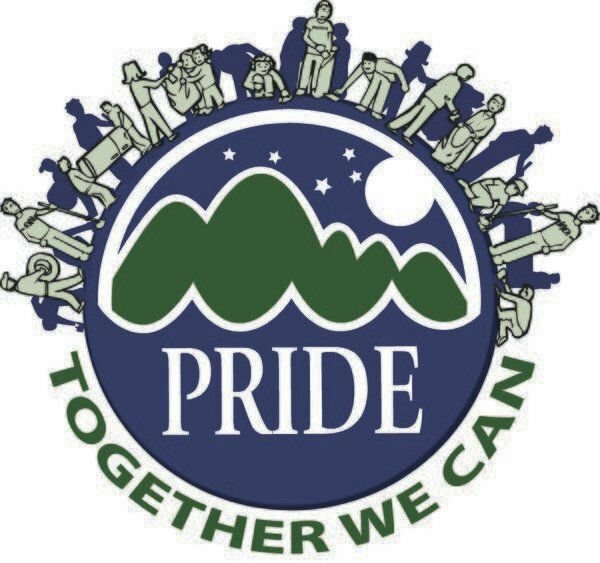 PRIDE will provide trash bags and gloves to volunteers who want to pick up litter and dispose of it with their own trash. For assistance, call the PRIDE office toll-free at 888-577-4339. The organization works with PRIDE Coordinators to organize cleanup activities, recruit volunteers and track cleanup results in individual communities. "April is always a big month," Pulaski County Recycling and Solid Waste Coordinator Danny Masten, who serves as the county's PRIDE Coordinator, said. Masten noted that the county's signature cleanup event, the PRIDE Clean Sweep, is next Thursday. "That's for anybody and everybody in the county who wants to get involved," he continued. "Last year we had 1,100 volunteers on [US] 27 and off the beaten path. We've got a group of 130 kids coming to Pulaski Park to help pick up down there.…People are really excited about getting involved.…It's always a fun event." Volunteers are encouraged to contact their local PRIDE Coordinator after they pick up litter and dispose of it with their trash so that those hours may be added to the city or county Spring Cleanup tally. PRIDE will recognize the region's cities and counties with the most Spring Cleanup volunteers. Danny Masten, Pulaski County, 606-677-0320.Jason White, City of Somerset, 606-679-1107.Crissa Morris, City of Burnside, 606-561-4113.Beth Wheet, City of Science Hill, 606-423-4109.Debbie Lake, City of Ferguson, 606-679-6800.Bobby Daws, City of Eubank, 606-379-2211.For more information about the #TrashtagPRIDE challenge or the Spring Cleanup in general, visit www.kypride.org or call 888-577-4339. You may also look for Eastern Kentucky PRIDE on Facebook.